February 1947. March 1947. 251 The WCTU met Feb. 18, 1947 at the home of Mrs. John Evans. The President, Mrs. Hicks, called the meeting to order. Rev. Stewart led the devotions based upon a portion of Scripture found in Romans 12. After singing one verse of a hymn, devotions were concluded with prayer by Rev. Stewart. The program was in change of Mrs. Jackson who introduced Rev. Skiles as the speaker. His topic was "Danger from Narcotics." Some very stirring statistics were presented, as well as helpful advice and encouragement, in the fight against these evils. 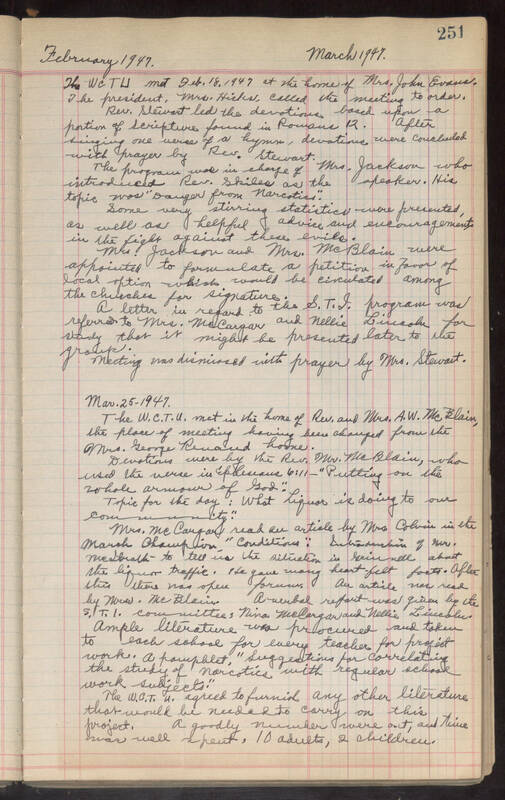 Mrs. Jackson and Mrs. McBlain were appointed to formulate a petition in favor of local option which would be circulated among the churches for signature. A letter in regard to the S.T.J. Program was referred to Mrs. McCargar and Nellie Lincoln for study that it might be presented later to the group. Meeting was dismissed with prayer by Mrs. Stewart. Mar. 25, 1947. The W.C.T.U. met in the home of Rev. and Mrs. A.W. McBlain, the place of meeting having been changed from the Mrs. George Renaud home. Devotions were by the Rev. Mr. McBlain, who used the verse in Ephesians 6:11, "Putting on the whole armour of God". Topic for the day: What Liquor is doing to our community." Mrs. McCargar read an article by Mrs. Colvin in the March Champion, "Conditions." Introduction of Nurs. [Medbrath?] to tell us the situation in [Grimnell?] about the liquor traffic. He gave many heartfelt facts. After this there was open [illegible]. An article was read by Mrs. McBlain. A verbal refort was given by the S.T.I Committee, Nina McCargan and Nellie [Lineblw?]. Ample literature was procured and taken to each school for every teacher for project work. A pamphlet, "Suggestions for Correlating the study of Narcotics with regular school work subjects." The W.C.T.U. agreed to furnish any other literature that would be needed to carry on this project. A goodly number were out, and time was well spent, 10 adults, 2 children.